He is super sweet and looks like he just had a haircut. He had no ID and needs some help now. Please SHARE for his life, he's SO special and a FOSTER or ADOPTER would save him. 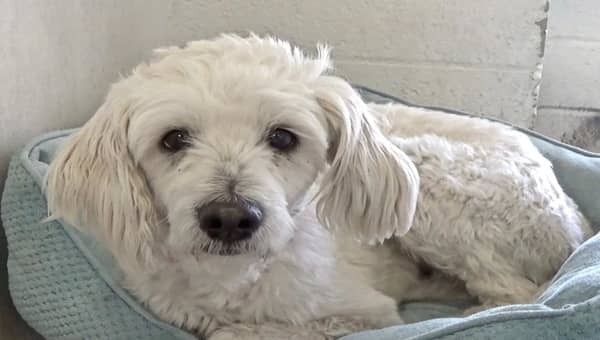 #A5161758 My name is MIKEY and I'm an approximately 2 year old male Poodle Mini. I am not yet neutered. I have been at the Carson Animal Care Center since 3/27. I will be available on 3/31. You can visit me at my temporary home at C234. My former family who owned me for had to give me up with no reason given. Somehow he has forgiven his past struggles and pain. Quiet in his kennel he waits for an invitation for a walk, shy, out of sorts, unsure, but every inch the lady. There's love and then there's love, and he is LOVE. 2 Responses to "I had a family and was loved just for a while - frightened Poodle pup brought to the shelter to die"
This will be a wonderful companion for someone. I have a mini poodle, who was rescued from a horrible life. She loves her Sisters, a Cairn rescue and a small grey, fuzzy mix doggie. Poodles are beyond smart!They are intuitive and loyal!Someone will be lucky to have this boy!! I would LOVE to adopt Mikey I will take him home as soon as possible the only thing is I am on the east coast in CT. Can he be shipped? I will love him forever and always. Please reply I can not even find info as to where he is! I know you call him Mikey. would Mikey like to live in Connecticut?